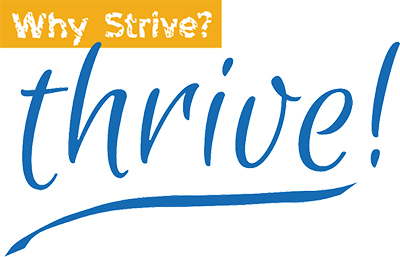 FAQ | Why Strive? Thrive! Coaching is a professional partnership to assist you in achieving your professional and personal goals. In the coaching relationship, you focus on the skills and actions necessary to successfully produce relevant results. Coaching begins with an initial session to determine your current opportunities and challenges, to define the scope of the coaching relationship, and to identify priorities and specific outcomes. Subsequent coaching sessions are scheduled relative to the amount of support, feedback and accountability clients feel they need. Between coaching sessions clients will be asked to complete specific actions that support the accomplishment of personalized goals. The coach may provide relevant articles, suggest books, models, assessments, checklists or other resources to support your thinking and actions. Coaching sessions can be in person or over the phone/Skype/Facetime. This provides flexibility for each client. For organizational clients, Carol may visit the worksite to observe and coach clients in their daily environments. The most important thing is to find a coach with whom you feel you can easily relate and create a positive and powerful partnership. Simply living a long and interesting life does not make a person qualified to be a coach, so be sure to check out their credentials. These include the coach’s experience, their training, certifications, affiliations with professional coaching organizations, and coaching philosophy. The length of the coaching relationship is dependent on the client’s needs and preferences. Typically, a coaching relationship lasts 3 to 6 months. Some people may find it more beneficial to have a more extended coaching engagement. A minimum of three months is recommended to experience the true impact of coaching. Prospective clients schedule a 30-minute complimentary coaching session. During the session, you’ll share your situation and what you want to accomplish in coaching. Carol will ask questions to understand how best she can support you. The conversation will also allow you an opportunity to preview what coaching with Carol is all about. Professional coaching is a service that focuses on your life as it relates to goal setting, outcome identification, and personal change management. The arena for professional coaching can be career, leadership development, relationships, communication, personal development, or an integration of some or all of these areas. Coaching is forward moving and future focused. Outcomes are client initiated changes to accomplish specific actionable results. The emphasis is on action, accountability and follow-through. Working with a therapist is often focused on healing pain, dysfunction and/or conflict within an individual or a relationship between people. Therapy outcomes are for improved emotional states and self-regulation. A therapeutic relationship may include confronting the past while planning for the future. Take Carol’s survey to find out if coaching is a good fit for you.